Nobody likes talking about any type of cancer. It’s a scary epidemic that continues to take the lives of thousands each and every year. Oral cancer, specifically, is a fairly common type of cancer in the United States with over 45,000 cases diagnosed every year. Of those diagnosed, about 9,700 will lose their battles with the disease. At our Eastanollee dental office, we want to take time during Oral Cancer Awareness Month to educate our patients and neighbors on the risk factors and signs of oral cancer, and why it’s so important to catch it early. Oral cancer is very treatable when caught early, which is one of the reasons that maintaining appointments with your dentist is so important. In between your dental visits, it’s best to know the early signs of oral cancer so you’re able to seek treatment quickly. 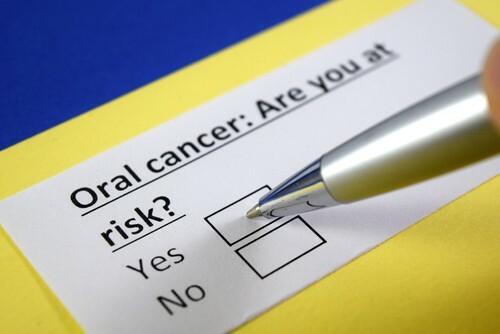 There are several lifestyle and hereditary factors that can increase someone’s risk of developing oral cancer. Please know that while these are common risk factors, anyone can develop oral cancer even if none apply to them. Age: The majority of oral cancer patients are over the age of 55 and on average, most people are diagnosed at 62. Tobacco: Nearly 80% of oral cancer diagnoses are in tobacco users. Alcohol: About 70% of those diagnosed with oral cancer are heavy drinkers. Tobacco & Alcohol Combo: Those who use tobacco and drink heavily have a 15 times greater risk. This Oral Cancer Awareness Month, take control of those risk factors that you CAN change and quit smoking, chewing tobacco, or using alcohol excessively. If you have other questions about oral cancer, call our dental office in Eastanollee. Welcoming patients from Eastanollee, Toccoa, Habersham County and beyond.